Dermal fillers are used to treat volume loss which occurs as a result of aging. They can be injected under the skin to help replace volume loss by plumping up the skin. Fillers can also be used to develop the shape of the lips, smooth creased skin and improve the appearance of scars. 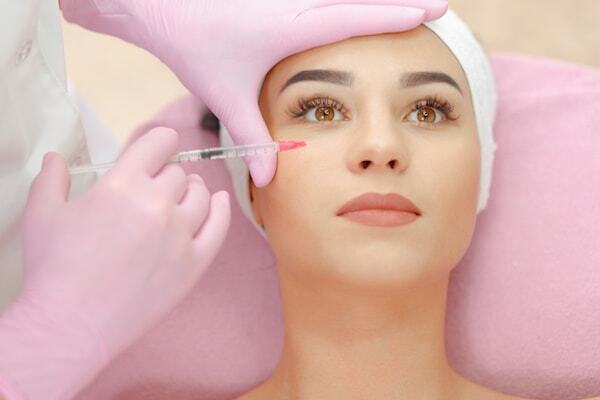 Botox injections are typically used to improve fine lines and wrinkles by temporarily paralyzing the contracting muscle, located beneath the wrinkle, in order to allow the skin to relax and smooth out. Both treatments provide smoother skin and a more youthful appearance. During the aging process, people lose subcutaneous fat which causes the skin to appear saggy. Gravity pulls on the muscles and skin and causes deep folds. Since the muscles are working closer to the surface of the skin, facial creases from smiling and the crow’s nest along the sides of the eyes become more evident. The forehead, eyelids, nose, chin and neck are also noticeably changed by volume loss and wrinkles. The effects of aging occur at different rates and vary from person to person. Smoking, sun exposure, emotional stress, heredity, diseases, dramatic changes in weight and overall lifestyle are all factors which can impact the skin and accelerate the aging process. Between the ages of 30 and 40, patients may start to see some shadowed contours under the eyes due to fat loss. This can make a person look older and tired. Fillers can be used to gain volume under the eyes. The nasolabial fold, which are “smile lines” that run from the nose to each corner of the mouth, can form a deeper fold. Dermal fillers work well when injected into these creases to plump the skin back up. The upper eyelids can become weak and forehead frown lines and crow’s feet can become more apparent as natural collagen within the body is lost. Patients may benefit from a combination of Botox and dermal fillers to remedy these conditions. Between 40 and 50 years of age, lower eyelid bags as well as forehead wrinkles and the lines between the eyebrows can become more apparent. These areas are best treated with dermal fillers and Botox. The eyes can appear sunken due to fat atrophy in the orbital area and patients may start to see a hollowing of the cheeks and temple area which can be treated with fillers. Dermal fillers can be used in combination with liposuction and/or a facelift. This can be seen in patients with excessive neck skin and in cases where the cheek fat begins to descend downwards. Facial filler treatments can be performed in the doctor’s office and require no downtime. They have minimal risks and complications. The injections only take a few minutes per site and the whole process can take 15 minutes to an hour. The time depends on the amount of injection sites. The treatment areas may feel tender for a day or two but no pain medications are needed. Patients can apply ice packs to minimize swelling or to relieve any discomfort from the injections. The risks with facial fillers are minimal as long as the doctor is adequately skilled in techniques and facial anatomy. However, some of the most common side effects include minor swelling, bruising, bleeding from the injection site, asymmetry or lumps. These conditions usually subside within 1-3 days and lumps can be massaged into the skin.